Drs. Steven White and Brad Haines, compassionate and experienced dentists, are now educating patients on common signs and symptoms of sleep apnea in Cornelius, NC, and welcoming new patients for a sleep apnea consultation, with or without a referral. New patients with sleep apnea in Cornelius, NC, are now welcome to receive treatment from Drs. Steven White and Brad Haines, with or without a referral. Drs. White and Haines are respected dentists who are experienced in effectively treating sleep apnea. They also seek to raise awareness of the seriousness of the condition and the many symptoms that can accompany it. Drs. 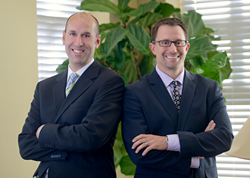 White and Haines are experienced dentists who offer leading treatment for sleep apnea in Cornelius, NC. With over 18 million Americans suffering from this condition, it is very prevalent among adults in the United States and can cause a variety of nighttime and daytime symptoms. Some of the most common sleep apnea symptoms include snoring, unexplained daytime fatigue and shortness of breath or headaches upon waking. In addition to limiting a person’s quality of sleep, sleep apnea can also be life threatening. Those who suffer from chronic lack of sleep are more likely to have compromised immune systems which can lead to the development of dangerous health conditions and diseases. Additionally, sleep apnea can cause people to fall asleep at unexpected times, which increases the risk of car accidents. Drs. White and Haines are experienced in a variety of sleep apnea treatments. In most cases, a simple mouth guard is all that is needed to achieve a quality level of sleep. The mouth guard is designed to be worn over the teeth at night and is created from impressions of the patient’s teeth. This custom oral appliance prevents the tongue from sliding backward and blocking off the airway while keeping the jaw in an optimal position for sleeping. Drs. White and Haines are trusted dentists who strive to offer the latest dental treatments to ensure their patients can live a healthy life. They encourage patients who are experiencing symptoms of sleep apnea in Cornelius, NC, to schedule a consultation by calling White and Haines Advanced Dentistry at 704-896-9535. White and Haines Advanced Dentistry is a general dental practice offering personalized dental care to patients in Cornelius, NC. Dr. Steven White offers more than 20 years of experience in general and cosmetic dentistry and has served as a mentor at the Nash Institute for Dental Learning and an instructor with the Advanced Aesthetics Program. Dr. Brad Haines was named a Top 40 Dentist Under 40 in Incisal Edge Magazine and brings more than a decade of experience in general and cosmetic dentistry. Drs. White and Haines strive to understand each patient’s unique set of goals to help them reach a healthy smile and they are members of the American Dental Association, Dental Organization for Conscious Sedation and Charlotte Dental Society, among many others. To learn more about Drs. White or Haines or the services they offer at their practice, please visit their website at http://www.drswhiteandhaines.com or call 704-896-9535 to schedule an appointment.